On these 5 reels the Princess of polar lights seduces you into her fascinating world of ice and snow! 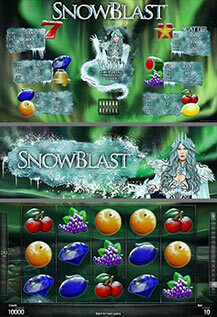 Snow Blast™ combines the innovative ALLPAY® concept with Reel Refill™ for additional win chances. The frozen symbols in winning combinations crack into small pieces and empty spaces are filled up with new symbols. WILD substitutes all symbols except SCATTER. All prizes are for combinations from left to right, except SCATTER.